Beads have been made of glass for over 5,000 years. The discovery of fire was the essential step in glass bead making. There is evidence as early as 2340-2180 BC in Mesopotamia of a method known as "core-forming" where they used a metal mandrel with pieces of glass held over a flame. Gradually as the glass soften, they would wrap it around the mandrel forming intricate ornaments. These early beads, or vessels were considered valuable and were preserved as they were placed in burial tombs. In Nuzi (130 miles north of Baghdad) beads were discovered that date to around 1400 BC. Even today, we make beads by holding glass rods over a flame then gently winding the molten glass over the mandrels. The invention of the blow pipe in gave way to the creation of the Rosetta bead and the seed beads which sustained the bead making industry in Venice for centuries. Beadmaking is truly an ancient artform. The history of beadmaking in Venice goes back to the days of Marco Polo when he returned from his travels with the beads of Asia. Local artisians took to their glass making skills to reproduce in glass the precious stones of Marco Polo. In Venice and Murano, the beading industry has historically been a woman's work. In the picture above you see the women working while caring for their children. 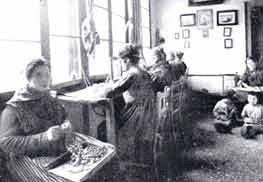 During the 1920s - 1930s, the conterie (seed bead) industry sustained Venice's glass industry. The wars took the men from the furnaces and between World War I and World War II there was little time to build up the industry. During the 1930s there were as many as 30 companies making the tiny beads, employing hundreds of women. Hollow tubes produced then chopped and refired for smoothness and color. Sold in shanks prestrung or by the kilo. Used in decorative jewelry and clothing. The peak of this production was in the early 1900s and today the industry is virtually non-existent in Murano. Produced from the canes known as Rosetta which had a center hole. First produced in Murano at the end of the 14th Century. It was made of a hollow cane and six layers of glass (white, blue, white, brick red, white then finally blue). It was ground to produce patterns of 5 concentric stars with twelve points. 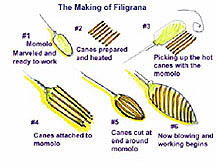 The canes were chopped and this production method increased greatly the quantities of beads which could be sold. Later as this cane was produced without the hole and the Millefiori canes were born which today create the famous Murano Millefiori beads or sometimes known as lace beads. With the introduction of the lampwork flame, beadmakers discovered they could melt the canes and then blow the glass. Today our spiral blown beads and beads with stripes of color are produced using the Filigrana Method where canes of glass are laid down and picked up with a blow pipe. 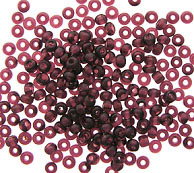 Often called wound beads because the melting glass is wound over a mandrel. Originally the Venetian beads were wound over a ferrous mandrel which had been covered with a mixture of silica and clay which gave the bead some room for contraction when it cooled and helped remove the bead from the mandrel. This material was originally known as "fango" meaning mud and legend is that it was, indeed, the mud from the lagoon. In the 1920s copper mandrels were introduced into Murano by the Moretti firm and soon became the standard for making beads. It was considered an economical as the mandrels did not need to be coated and minimized breakage in removing from the mandrel because mandrel was cut off just below the bead and the entire bead was placed in Nitric Acid which etched the copper from inside the bead. However, environmental standards are adding to the cost of this process and many small beadmakers do not have the equipment, rather they take bags of beads to one or two shops who specialize in this etching process. Today's beadmakers in Venice and Murano use both methods, using stainless steel with a bead release material for more delicate beads or beads with silver which tends to burn (turn dark) if it touches the acid. Murano beads are made much in the same was as thousands of years ago.